The device they created is a bit "like a little metal screw with a hole in the top," Vishal Patil, one of the researchers, tells NPR's Rebecca Hersher. "You put the spaghetti into that and then push that screw into another dial until it locks. Then you rotate the dial to twist the spaghetti." Perhaps you've heard that classic anecdote about Richard Feynman, the Nobel-winning theoretical physicist, who famously spent hours with a buddy puzzling over why uncooked spaghetti always breaks into more than two pieces. Perhaps you're one of those incorrigible monsters who break their pasta before boiling it (how dare you) and wonder why you end up having to vacuum afterward. Or perhaps you have no idea what we're talking about. In which case, just watch this slow-motion video of spaghetti snapping, set to some truly moving piano music. Whatever the case may be, you've probably noticed there's a mystery here: Why the hell doesn't spaghetti just snap in half — and is there anything in this wide world that can make it actually do so? As it turns out, a pair of scientists figured out the answer to that first question more than a decade ago: Essentially, the dry noodle bends before it breaks, so that when it breaks, it does so with more power, sending vibrations racing back through the remaining pieces, bending and breaking them in turn. The discovery won them an Ig Nobel for silly or surprising research — but it did not, in fact, answer how anyone can overcome this effect and make a single clean break. The answer to that grand riddle had to wait years for a new pair of heroes: mathematicians Vishal Patil and Ronald Heisser. 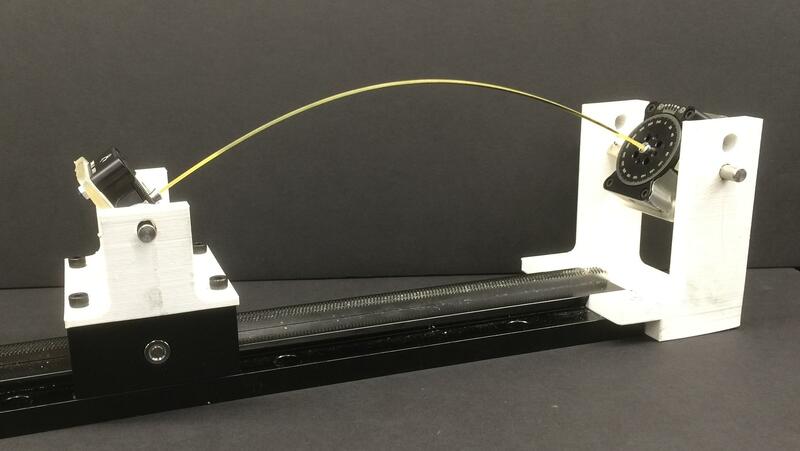 In a study published Monday in the Proceedings of the National Academy of Sciences, the two graduate students and their three co-authors explain that the key to breaking a noodle cleanly in two rests in twisting it. "When you twist it, you don't have to bend it as much before it breaks," Patil tells NPR's Rebecca Hersher. "When there's less bending in it, the snap-back — as the spaghetti tries to become a straight rod again — is weakened, so that no more fractures can occur. Ordinarily, when the spaghetti breaks, the snap-back is strong enough to create more fractures along the rod." So far, so good. But they ran into a problem: They found that the amount of twisting necessary to do this was just beyond the abilities of their bare hands. So Heisser built a device to do it for them. Sadly, this means our puny human hands are probably incapable of the amount of twisting, plus the firm but gentle grip, needed to achieve the feat on their own. Still, it's comforting to think something out there can manage what we once thought impossible. And their discovery also may have applications outside the kitchen. "It should happen to any brittle elastic rod. My favorite example is pole vaults. Sometimes pole vaults break, and when they do, you'll often see more than three pieces," Patil tells Hersher. "In general, the principle of dividing up the fracture energy into different modes — like dividing it up into bending and twisting to control the fracture — that's something which could be applicable to more complicated materials. We hope." In the meantime, though, he plans to lay off the pasta for awhile. "I think after the hours we spent in the lab," he laughs, "it's going to be some time before I want to eat spaghetti again. And now, breaking spaghetti news - I'm being serious here. This is news about how to break spaghetti exactly in two. Here's NPR's Rebecca Hersher. REBECCA HERSHER, BYLINE: OK. So bear with me. I have a box of spaghetti here. All right. 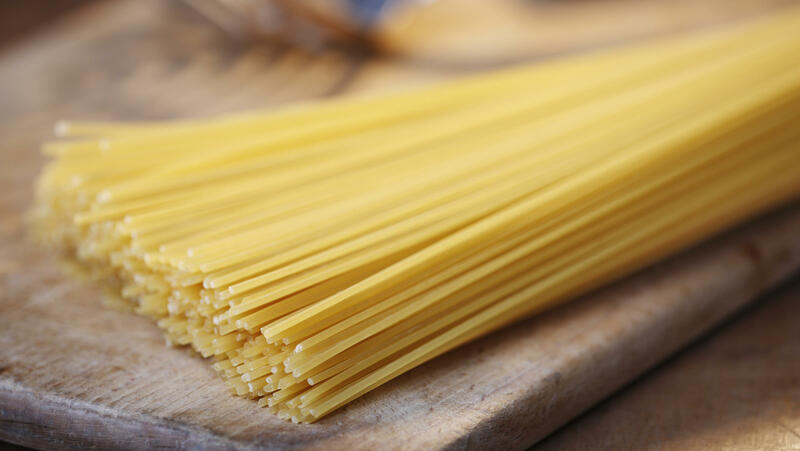 Fans of home-cooked Italian food have probably noticed that strands of spaghetti - normal, dry spaghetti - are actually really hard to break into only two pieces. OK. I'm holding it at either end, carefully bending it. I'm going to break it exactly in the middle. HERSHER: (Laughter) One, two, three - four pieces. VISHAL PATIL: OK. So I'm Vishal Patil, and I'm a graduate student in mathematics at MIT. HERSHER: Vishal is super smart and ambitious. Unfortunately, he's also spent the last couple of years playing with pasta at work, trying to figure out whether it's possible to break a piece of spaghetti into exactly two pieces. PATIL: When you broke it just now, you probably noticed that the pieces go flying and it's all a bit random. So we were interested in what you could achieve by being a little more clever about how you break it, I guess. HERSHER: Clever, like with a twist - but actually, a twist. Patil worked with a colleague, Ronald Heisser. They figured out that if you twist a piece of spaghetti when you bend it, it breaks into fewer pieces. They published their results this week in the Proceedings of the National Academy of Sciences. PATIL: When you twist it, you don't have to bend it as much before it breaks. HERSHER: Think of spaghetti as a rod that just wants to be straight. The more you bend it, the more power it snaps back with after it breaks. PATIL: Ordinarily, when the spaghetti breaks, the snapback is strong enough to create more fractures along the rod. HERSHER: Twist the spaghetti, and it bends less. That means it fractures just once. Sounds like a major breakthrough for people who have been flinging spaghetti shards all over their kitchens for decades, right? PATIL: Here's where it gets a bit (laughter) - a bit harder in that to twist it the amount you need to actually just break it into two pieces, you need to twist a 24-centimeter spaghetti by around 260 degrees. HERSHER: More than halfway around. PATIL: Yeah, almost all the way around. HERSHER: It's basically impossible to do with your hands. His experiments use custom clamps and high-speed cameras that take a million pictures a second. That means this has nothing to do with cooking. But Patil says it's some beautiful math. Rebecca Hersher, NPR News. EMINEM: (Rapping) His palms are sweaty, knees weak, arms are heavy. There's vomit on his sweater already, Mom's spaghetti. He's nervous. But on the surface, he looks calm and ready to drop bombs. But he keeps on forgetting what he wrote down. The whole crowd goes so loud. He opens his mouth, but the words won't come out. He's choking. How? Everybody's joking now. The clock... Transcript provided by NPR, Copyright NPR.